Thomas Davis, writing in the 1840s, urged his readers to ‘seek for histories’, ‘create museums’ and ‘study the manners of the dead’ in order to ‘create for the future’, the museum enthusiast can only whole-heartily agree. The museum exhibition is now one of the pre-requisites of commemoration and indeed serves a purpose which no textbook, lecture or TV documentary can surpass. The joy inherent in visiting a museum is derived from being able to see for yourself the material remains dating from the period in question. This act of foreshortening time brings a sense of the events into the present day, the past is made immediate and can be ‘experienced’. This year, the events of 1798 were well served with a multitude of lectures, conferences, books and displays. From this generous range, I chose to visit three exhibitions: Up in Arms in the Ulster Museum in Belfast, Fellowship of Freedom in the National Museum in Dublin and the permanent display at The National 1798 Centre in Enniscorthy. It is always interesting to find out how different people tackle similar themes and visiting these three institutions I was struck by how differently the same historical events were handled. Seeing the three displays was a rewarding exercise, which fed my interest in the methods of interpretation and display used in museums, and the function of museums themselves. How the success of each exhibition is judged is determined by a consideration of the purpose of the museum. If it is to preserve and display the material remains of the past in an educative and entertaining way then Up in Arms succeeded. In excess of 300 artefacts (though many were reproductions) from over thirty donors lead the visitor through the exhibition. In fact, the wealth of artefacts on display was its main characteristic. This ability to display the original object gives the museum a long-term advantage over the heritage centre which is usually less dependent on artefacts. Without a full range of original artefacts some of the pleasure of history must be lost. Up in Arms consisted of twelve sections which traced the relationship between England, Ireland, France and America in the eighteenth century; the establishment of the Volunteers, the United Irishmen and the Orange Order; and the events of the Rebellion and the subsequent union between Great Britain and Ireland. Within this framework the visitor could view the expected, such as the Volunteer coat of Henry Joy McCracken, the portraits of William Drennan and Robert Emmet, as well as more bizarre items such as a pair of whale teeth engraved with the portraits of George III and Queen Charlotte. The Belfast exhibition succeeded in being an attractive and accessible introduction to 1798. Visitors were able to approach the displays in a number of ways, according to their interests and background. A child may have enjoyed the mannequin displays with background narration (triggered by a push-button) or the model boats of eighteenth century warships. Similarly, they may have delighted at the pikes which were on open display or the slide show which depicted scenes from revolutionary Paris, including the guillotining of Louis XVI in 1793. For the adult visitor short introductory panels were provided tracing the events leading up to and of 1798. One could also make use of the portable audio-guide which provided a forty-five-minute tour bringing attention to key artefacts on display and providing a further enjoyable, dimension to the exhibition. The most zealous may have bought the full exhibition catalogue which gives an account of the history and provenance of each object. Since even a quick reading of the panels and glances at the displays would easily take two hours, and a more thorough visit the best part of a day, the exhibition would have provided a substantial introduction for most visitors. The sheer number of objects, documents, portraits and paintings displayed in Up in Arms amply demonstrates the rich heritage which is the historian’s material. It also suggested a display policy which, in an effort to be non-discriminatory, sometimes resulted in the exhibition being overly dependent on the objects, at the expense (in places) of the narrative. Here the objects came to dominate and the visitor was in danger of drifting from display to display, and of regarding the exhibits as art rather than political or social history. If this happens the historical context can be lost, the visitor is distracted from the storyline and the relevance of some objects becomes tenuous. For instance, a set of mid-nineteenth century surgical instruments were displayed apparently only because they were similar to what would have been used on the battlefields of 1798. Likewise, the relevance of the bronze statue of Robert Burns was reduced to a few words. The visitor was only informed that his poetry was admired by some of the revolutionaries. Though the Burns statue may have deserved its place, without the provision of further historical context the political significance of Robert Burns (who was sympathetic to the French Revolution) was unclear. Up in Arms targeted a broad audience and therefore could not provide extensive analyses of the historical events of 1798 which would be of interest to an academic audience. This cannot be said of Fellowship of Freedom in the National Museum. Written and planned by Kevin Whelan, Director of Notre Dame’s Centre for Irish Studies, the exhibition is a compliment to his research in the area and is pitched for those who already have a knowledge of the period. The text panels, which are a major part of the exhibition, convey his characteristic use of language and provide analyses packed with information. The risk of this kind of exhibition is that the less well informed public my feel daunted by detail and terminology. The first thing the visitor sees on entering the exhibition are the death masks of Wolfe Tone, Robert Emmet and Cornelius Grogan. The sombre mood of the room, with the masks back-lit and encircled with a wall of quotations on rebellion, gave no hint of a celebration of the insurrection. After this first, stark room, the main exhibition is laid out around the circumference of the second room. It is composed of eight sections, each one with a lengthy text panel followed with a patchwork of illustrations. 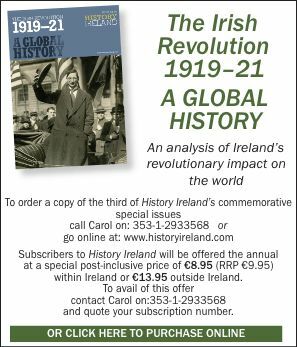 The text places the Irish rebellion in the context of events in America and France, as well as outlining the experience of Ireland as a British colony, the establishment of the United Irishmen, the spread of rebellion throughout Ireland and the British response. A central case exhibited a selection of about thirty-five objects, while an interactive CD-ROM provided interpretations of paintings from the period. The style of the presentation, relying as it does on a lecture and slides format and the occasional use of certain concepts and terminology on the panels, would have distanced those not equipped with prior knowledge of 1798. In addition, the exhibition eschewed the usual museum ‘tricks of the trade’ which make a text-heavy display more approachable: for instance, by putting the main point of each text panel in the first few sentences (allowing for movement from panel to panel with minimal reading); or by the progressive reduction of the amount of text through the exhibition and the variation of presentation techniques. Without these, this exhibition may have been difficult for the newcomer to Irish history as well as those who do not frequent museums. The research and the method employed in the Dublin exhibition worked well in the companion volume which promises to continue in popularity beyond 1998. The book is largely a reproduction of the exhibition and in this format the information is much more accessible. The images, which are lost on the exhibition panels, are easier to appreciate in the book. It is markedly different from the volume produced to support the Belfast exhibition. The latter succeeds as a catalogue of the collection with extended essays on the artefacts on display and would be useful for those interested in the material record. Comparing the two exhibitions, Belfast’s was object-led with minimal interpretation. Fellowship of Freedom was, by contrast, assigned with a clear objective. Rather than being led by the rich contents of museum and archive stores, the latter was an ideological exercise, an opportunity to realise, in Whelan’s words, ‘a radically different perspective on the rebellion’ and through visual ‘rememoration’ to ‘elevate politics out of the sectarian rut’. In competing for scarce resources a museum is required to be increasingly accountable, innovative and popular. In order to achieve this museums should not be too proud to take lessons in display and public communication from the methods employed by non-museums, such as heritage centres. The latter serves a completely different purpose. Unlike the museum, the heritage centre is a transient endeavour existing for the tastes of tourism. The centres, though often well researched and presented, mostly provide static displays suggesting a potentially short life-span and they display few if any tangible remains of the past. For these reasons the heritage centre should not get state-support at the expense of the museum, only in addition to it. However, given the success of some of the centres which already exist, museums would do well by adopting some of the display methods which have made them so popular. A successful example is the National 1798 Centre in Enniscorthy which provides a most enjoyable visitor experience. Unlike the temporary exhibitions reviewed above, the Centre did not have the same restrictions of pre-determined galleries or a tight museum budget. It is housed in a specially redeveloped Christian Brothers’ school (not, thankfully, on a green-field site on Vinegar Hill). It also had at its disposal in excess of £2 million derived from the Operational Programme for Tourism, private donations and local fund-raising. The visitor experience starts outside the building by crossing ‘the bridge of democracy’. On the inside, the exhibition display follows similar themes to the others: the opulence of pre-Revolutionary Europe; the spread of revolution; the Irish context; the United Irishmen; the chain of battles in May and June 1798; Vinegar Hill; and the aftermath of the rebellion. In addition, consideration was given to the political legacy of 1798 and the different ways the period has been interpreted by historians. What stands out, however, is the display technique. Some of the methods employed are ingenious. A good example is the captivating presentation of ‘The Great Debate’ between Thomas Paine, the author of The Rights of Man, and Edmund Burke, who wrote Reflections on the Revolution in France. The debate is re-enacted on film and projected onto huge panels of their own texts, giving the impression that their work and personalities were intertwined. The display succeeded in stopping the visitors and getting the aspects of the debate across in a most engaging way. Following this dramatic display, the visitor moves on to view the ghost-like life-size plaster figures in the following two rooms (much superior to dressed-up mannequins) which represented the people of eighteenth century Ireland. The tape in the background narrated the unfolding awareness of the spread of revolutionary ideas through Ireland, putting across a sense of growing urgency at grassroots level. A clever analogy of a game of chess is used to reconstruct the ‘deadly game of strategy’ that is politics in the following room. The main figures of the day were represented as six-foot chessmen laid out on a chequered floor; the king on the Irish side being, of course, Wolfe Tone. This ‘deadly game’ materialises into a string of battles, listed in the following room, which led up to Vinegar Hill. The poignancy of war is made all the more apparent in the film which informs the visitor that County Wexford experienced eleven of the twenty-three battles and, in a four week period, lost 20,000 people from its population of 120,000. By comparison, the visitor is told, the first six years of the French Revolution cost the lives of 25,000 people from a population of thirty million. The National Centre, from its lively exhibition to its attractive text panels, is an entertaining display on 1798 and will be a popular location for a family day out. The school group I saw visiting enjoyed the cartoons which were displayed throughout, at a low level for easy viewing, as well as the chessmen and the 1798 themed play area at the end of the exhibition. The games allowed the children to interact with history in a very simple manner, simultaneously putting across a very serious message. Encapsulated in the throw of a dice, the games demonstrated how much of history was an exercise of chance. Up in Arms is a classic museum exhibition in the style expected in the 1990s, Fellowship of Freedom embraced a more theoretical angle and the National 1798 Centre has allowed itself a more popular approach. There is no monolithic or ‘best way’ to display the past. As exhibitions the three displays served different purposes and should be allowed to do so: every exhibition cannot be popular or pitched for the child nor should exhibitions shy away from any obvious political connotations. The 1798 Centre is very much a family day out and it provides everything essential for such a visit. It caters for adults for whom history is a leisure activity, who along with their family wish to be entertained. It is fair for such visitors to expect history to be displayed in a sophisticated manner with colourful displays which are easily read and fun for the younger members. This tourist approach to the past should not be scorned glibly as commodified ‘heritage’. Though not a proponent of a pre-packaged past, I would argue that such popular centres, when well researched, do provide an accessible entry point into the world of history and the presentation of the past in museums. Conventional museums have a dual purpose: the practical, as a storehouse of the material remains of the past; and the educational, as an opportunity to learn about the past in an entertaining way. Since they exist primarily to collect, conserve and care for the material remains of the communities for which they were founded, museums develop and change with those people. Far from remaining static, museum staff are constantly researching the history of the area which is their remit, setting up temporary exhibitions, providing educational services and adding to their collections. One needs only to look at the volumes accompanying Up in Arms and Fellowship of Freedom to realise the good work the museums and archives have done in preserving the material record from the 1790s. But for such dedicated work, the more popular exhibition at Enniscorthy would not have been possible. Heritage centres and museums may enjoy mutual influence, but it is the museums which should be celebrated as having the greater cultural value. They must in the end be considered a better investment of resources, so long as they remain as innovative as those reviewed above. Standish O’Grady wrote in the 1880s that museums are ‘more melancholy than a tomb’. Still today, some people who haven’t visited a museum recently may concur. They must visit the permanent galleries in the national museums in Dublin and Belfast and the regional museums such as in Enniskillen and Derry to see that museums have modernised. Elizabeth Crooke is a postgraduate student at the Department of Archaeology, Gonville and Caius College, University of Cambridge. D. Brett, The Construction of Heritage (Cork 1996). W.A. Maguire, Up in Arms: the 1798 Rebellion in Ireland (Belfast 1998). K. Whelan, Fellowship of Freedom: the United Irishmen and 1798 (Cork 1998). Up in Arms at the Ulster Museum ended on the 31 August 1998. A travelling exhibition derived from it is at Fermanagh County Museum, Enniskillen Castle from 12 November 1998-6 January 1999, tel: (01365) 325000. Fellowship of Freedom continues in the National Museum, Collin’s Barracks until 31 December 1998, tel: (01) 6777444. The National 1798 Centre, Enniscorthy is open all year round, tel: (054) 37596.